Appears with tables. Provides commands to manage sort order of columns. Columns may be sorted by Ctrl-clicking the column head. Shift-clicking the column head of additional columns will sub-sort by that column. Reapply the current sort order settings. Used to refresh order when the data in tables may have changed. This is not a command to restore previous sort order that has been cleared. Clear any sort order applied. A list of all columns that participate in a sort or a sub-sort. A list of all columns in the table that may be used for sorting. Click on one of the sub-menu fields to add it to the sort or sub-sort. 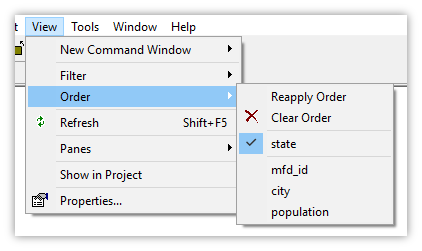 See the Sorting Columns topic for details and examples.